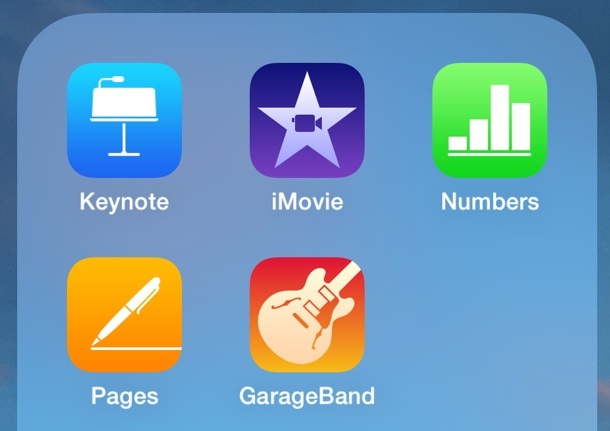 Most new iPhone and iPad models ship with the pre-installed iWork / iLife suite of apps, including Pages, Keynote, iMovie, Numbers, and Garageband. While this is a great collection of apps, many users who won’t be using them (or at least all of the apps) may rather have extra storage space available, which is nearly 3GB of storage in this case. There’s nothing unusual to this other than awareness of the space the apps take up, and you can easily see yourself if the iWork suite is pinching your available storage or not by going into Settings > About > Usage > Manage Storage. If you decide that Pages, Keynote, Numbers, Garageband, and iMovie are superfluous and you never use them, go ahead and delete the apps like you would uninstall any others in iOS. While this removes the apps from your iPhone or iPad, they will still be tied to your Apple ID, which means you can download them again at any time without paying. For me personally, I like having the apps around since they allow for some additional mobile work on the well-sized iPhone Plus model, particularly iMovie, which is also great for editing and saving slow-motion and time-lapse videos taken with the camera. 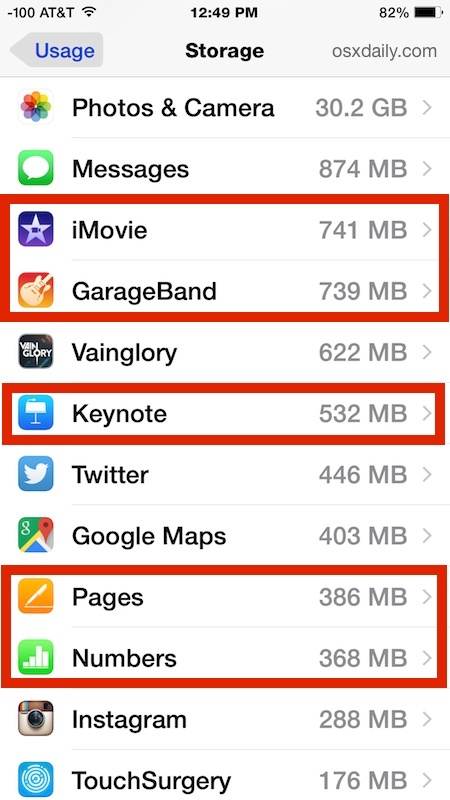 At the very least, knowing you can quickly recover about 2.7GB of storage just by deleting these apps from your iPhone is good to know, so if you get that dreaded “out of storage” warning when trying to take a picture or download a new app, you could just remove these apps and get a temporary reprieve. Note the iWork apps are not preinstalled by default on 16GB and 8GB iPhone models, because they can’t really afford the space consumption. That means you’ll only find these apps preinstalled on 32GB, 64GB, 128GB, and 256 GB devices. Since my iPhone has 128GB of storage, this is not a problem for me. Also, I use iWork instead of Office. Settings > General > Storage & iCloud Usage > Manage Storage. Settings > About > Storage & iCloud Usage > Manage Storage. Can anyone tell me how to remove “protected” duplicate photos from my iPad? I did not deliberately protect them — they are self-protecting. My younger brother bought a 128gb 7 and restored from his old phone, (which did not have these Apps on it), and when he went to reinstall these Apps they were not tied to his Apple id. So he is going to have to call Apple I guess. And Hillary and Donald don’t care. Menu structure above used to get to memory usage is incorrect on my 6. Confusing!